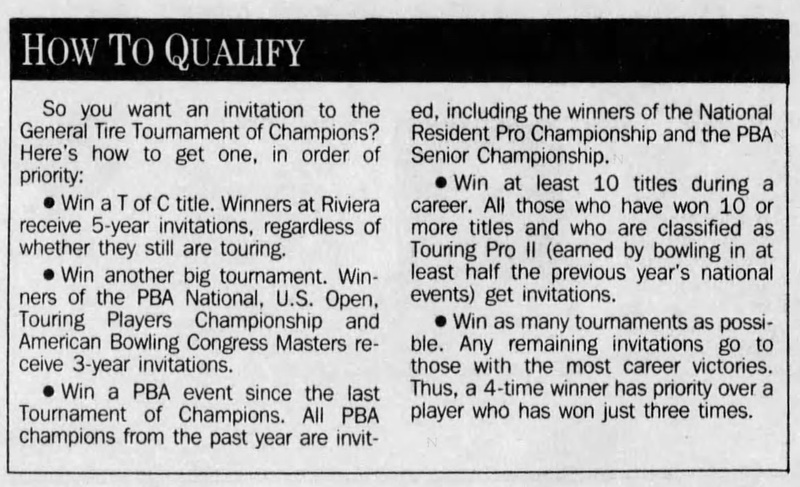 Pro Bowlers Tour Greatest Moments > Categories > General bowling discussion > So how exactly did players qualify for the Tournament of Champions in the 80s and 90s again? I was looking through the old results and saw that most years had 50+ guys who cashed (not sure if other guys were able to participate but didn't cash). But not everybody on the list had won a title at any time in recent years. For instance, I noticed Danny Wiseman cashed in the 1994 TOC but he hadn't won a title since 1991. I remember seeing Bo do an explanation of it on an upload of an old show but I have no idea which show it was, and I have long forgotten the explanation. The field for the Firestone was limited to 52 players back then. The link below is the standings from the 1986 Firestone all the way through 52nd place, and everyone cashed. There were always bowlers who were on the bubble, meaning, once you qualified by winning a PBA tournament, you were in the tournament, unless there was another new first time winner, then the bubble guy would be knocked out. If you won a major, then I believe you were locked in for 3 years. If you won the Firestone itself, I believe you had an automatic entry for life. On TV, Chris and Bo would always point out which bowler was on the bubble, when there was a non-winner in the title match of a tournament. I had not heard the part about TOC winners receiving a lifetime exemption, though it makes sense, just like the winner of The Masters golf tournament can return to Augusta as long as he can swing a club. What is the story behind setting the field size at a fixed 52 and not another number, or limiting the field to only tour event winners in a specified time period? It usually took several years for a bowler to fall of the top-52 list, depending on how often a non-exempt player won a tour event. I'm just guessing on some of this. I suppose the field was limited because of the guaranteed prize money. The PBA wanted all the qualifiers to appear, so they guaranteed a check to all the competitors, enough to make it worth showing up. They also wanted first prize to be the biggest prize of the season. Within those constraints they came up with the number of qualifiers. The first TOC was in 1962, and at that time there were only 25 champions. It was a special event, and another TOC was not held until 1965. For that tournament the 48 most recent winners were invited, a number which happened to include every winner since the 1962 TOC. It was then that the PBA decided to make this an annual tournament, and they liked the idea of inviting all the recent champs. They probably tweaked the qualifying rules slightly at this time, and came up with the format they would use for decades. Usually a new winner would be on the list about 2-3 seasons. That always changed depending on how many new winners there were each season. To me they polluted the pool when they opened it up and starting allowing regional champions in. It was a very exclusive club and I likes it that way. I included a 1985 Akron paper clipping from newspapers.com that explains this. It did change later on. But this method was used for a decent period in the 70s/80s. Firestone champs only got a 7 year exemption, not lifetime at that point. The field was usually filled by going down the list of touring pros with titles in order of how many they had won in their careers. Those who won titles more recently would be given higher priority in case of a tie. Here's the 1994 edition. Slightly different but better explained.